Chicken Chop found at Plaza Singapura Kopitiam! Looking for food that will keep you lean at Plaza Singapura? Check out this shop that sells grill chicken breast! – fire grill stall located inside Kopitiam food court. 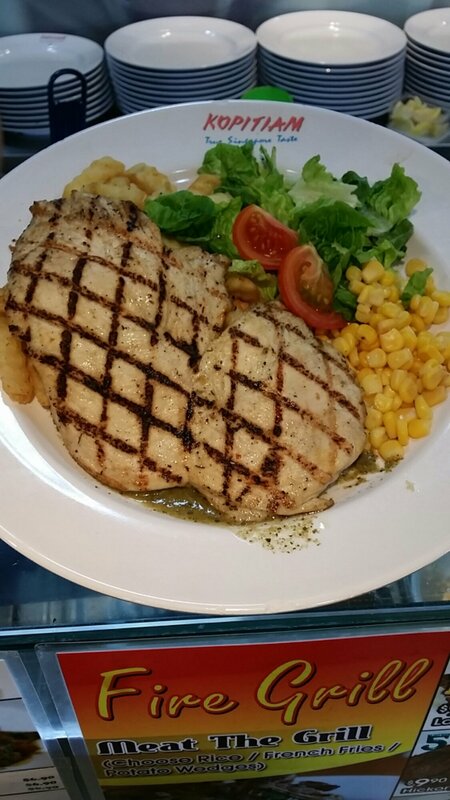 Introducing Caribbean chicken steak at the price of $7.90. 1 piece of chicken breast is 250 gram comes with 1 vegetables and 1 corn and 1 choice of carbohydrates will be fries, wedges or rice. The chicken breast is so tender and delicious. Unlike the one that we cooked. Which is normally hard and tasteless. Maybe because of the thickness that they cut and the way the chicken is cooked. They also have this special sauce for you to dip, a little bit of a sour taste to make the grill chicken more appetizing. Lean gains meal done at Plaza Singapura. Who say eating clean is gonna be hard! Follow me for more update on lean gain food!